Q? and A! s are questions and answers from reunion organizers. How would you have answered? And if you are stumped about some reunion organizing detail, we certainly encourage you to ask for help. Our answers often refer you to pages of our web site where many questions turned into articles or were answered in articles. Each year, particularly during reunion season (between Memorial Day and Labor Day), I receive many questions from desperate folks who have discovered a last-minute task. Requests for toasts, invocations and welcome words are among the most regular questions. If you are looking for such words, take a look at the summer 2000 issue of Reunions magazine. Here are answers to some additional frequent questions, and I hope these help save you the time of having to wonder. I urge you to survey your own family for capable assistants and perhaps even some leaders to be groomed so that you can be an honored and revered guest at your own reunion! You were wise to be working over a year in advance which certainly helped recruit family members because they realized that they still had time to get things done. Montague had not said if the reunion was at home or away. In either case, direction is also probably available from the convention and visitors bureau in the city where it’s going to be. In addition, most cities and many vacation areas have companies called “destination managers” who will see to the details of your reunion. Many cities have party planners, and even wedding planners can probably be enticed into a reunion during a slow period. Finally, many hotels/resorts have a person in their sales department designated as a reunion specialist who can take care of many of your needs. Theresa McSpedon wrote this question: what are some new ways to help ease the financial burden of travel for family members living far away? If your reunion is every year, perhaps planning a reunion every other year would allow some members extra time to save for the trip and expenses. Also, don’t always expect distant members to be able to afford every year. Jamila Z. Sloan, Jones Family Reunion, San Leandro, California, asked how to get more family to show up each year and more members interested in planning reunions. She wrote, Our family has an annual reunion around Kings County, California. Fresno, Visalia and Lemoore have hosted our reunions. We choose locations where family members live and were raised. Reunions last one or three days when we go camping. This may be a good news, bad news response. The good news is that Sloan seems to be doing everything right! She started out asking how to get more attendance then wrote her own answer by listing what she does which is very thorough and obviously has many fans. She should be proud of what she’s accomplished and satisfied that she obviously has members who are as enthusiastic as she. For members who do not attend, her newsletter and new committees may help. “Peer pressure” might also help. Ask brothers, sisters and cousins to contact their peers who aren’t coming, ask why and encourage them. If they don’t come, have a super time with those who continue to come. Use your enthusiasm to recruit cousins and encourage them to start taking responsibility for the reunion. Hand fashioned pot-holders and hankies from grandmother is a SPECTACULAR idea! Perhaps some handwritten/copied stories to go with these treasures would be a nice addition. You are very lucky to recognize that. Often many families don’t recognize even a small fraction of the work it takes to pull off a truly successful reunion. Yours is not an uncommon problem nor is it one that can’t be overcome. You don’t say what was different from the first to the second reunion. Were there differences? If not, perhaps that’s one thing to consider. Activities that intrigue might be part of what you should consider. But perhaps most importantly … like I am trying to convince my best friend … is that the number of people who attend is not nearly as important as that those who do have a terrific time. Those who don’t attend will surely get the message that they missed something wonderful. Also, if you’re burning out, are you doing it alone? Get others involved with tasks that they can do, love to do, are particularly good at or have a talent or skill. Delegate. Flatter your family by recognizing and utilizing their talents. Then, be sure to honor and acknowledge them in newsletters, on fliers and invitations and at the reunion. After that, when you ask again, they’ll say yes. You may even get volunteers who say they can do it better than anyone else: let them! If there are more people involved in details, there will be more ownership of the reunion. For each person helping you, there is a family so your numbers already go up and everyone who “owns” the reunion will be talking to others. I’m planning my parents’ fiftieth wedding anniversary reunion for family and close friends. I’d like to put together a memory book, requesting thoughts, wishes, stories, and pictures from guests. Any tips? Start early. Talk to people right away to get them thinking. Send a letter that makes all your wishes, desires and limitations clear. Emphasize a deadline. Include a stamped self- addressed envelope to persons who would have a problem assembling them. Be specific with some folks who either have special pictures or special experiences – ask them to include those stories or copies of those pictures. People that might have such information are members of their wedding party and early neighbors. Follow up. Follow up. Follow up. Don’t paste anything down until you have everything but do lay it out as much as possible. Follow up. Follow up. Follow up. Good luck. You’re not alone in this dilemma, so we’re always looking for solutions. These are just some. Offer an incentive (a small percentage off cost/fee) for early registration. Plan a prize or recognition at the reunion for the first registration received. Send a list of who’s responded and who’s not … shame sometimes works too! Never talk with family members without mentioning reunion registrations/responses. Get others working with you to get their responses in. Interestingly, I’ve discovered that people don’t routinely RSVP any more. But that still doesn’t make it right! George and Phebe Jane Wolford had a lot of children, two or three raised big families and stayed in Ohio. The other children moved out of state or had few or no dependents. There are over 200 descendants and we are lucky to get fifty to attend the reunion. Descendants are moving and getting married and it is hard to keep a directory. There might be only two people attending the reunion with the surname of Wolford. With people scattering, it becomes more important to have reunions but perhaps not each year. Or have some special celebrations that will entice those who’ve moved away back for a visit. Ask them what they want to do. Sounds like you may need to revisit how you’re organizing your reunions. That’s a challenge, but can be great fun if you include lots of others in your exploration about what to do. Plan something different or special that will attract the attention of your family … and perhaps attract others attention as well. 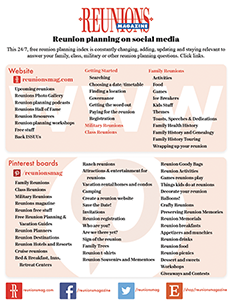 Get more people involved in planning and you’ll easily have more than two people at your reunion. But there’s also nothing wrong with having a reunion, no matter how small, with those who really want to come. Then, send a summary afterward that lets those not in attendance know they were missed. And what they missed. Let us know how you progress! Good luck. It is fundamental to decide where the reunion is going to be. How about alternating between the two places; one year in Shelby, the next in Mount Vernon? The only way we know is to ask. Carefully fashion a letter about your reunion, list the benefits of your reunion to the businesses … why they would want to be involved with your reunion. Include a bit of reunion history, what’s special about your reunion and about your family. After writing your letter, find out who at the company would most likely make the decision. Either ask for an appointment or send a letter with a request for an appointment. In any case, you must write your request to leave after a meeting or to mail. Then, carry copies to replace in case their copy gets lost or misplaced. It is essential to follow up with a phone call about a week later. Sorry we don’t have anything specific but would suggest you dig deep in family legend or tradition to find your inspiration. Since we know nothing about the family you’re speaking to, we suggest that you look at what their interests and concerns are. The future? Their strengths? Their creativity and determination? What inspires you? It will probably inspire your audience as well. How about saluting special family members? The oldest and youngest … not the usual prizes but something about each: the history of the oldest and the future of the youngest. Or salute the achievements of family members old and young; who’s learned to walk or graduated or gotten an award or honor? Something from your favorite book or author? the Bible? Shakespeare? Robert Frost? If you question your family’s enthusiasm, perhaps you should concentrate on humor and leave ‘em laughing. There must be lots of funny family stories. What are your favorite family memories? Share them. Get others thinking. Pose questions for members to contemplate. Challenge them. Charge them up. Great question! I think there are some family history games in regular stores; Generations, LifeStories, Reminiscing. Questions and Ancestors can be ordered from Conestoga Book Service, Box 7, West Willow PA 17583. Or make up your own games – word games, crossword puzzles. Make a list of questions about family history – it’s a great way for kids to learn about their ancestors. Check online genealogy book stores. Maybe www.familytreemaker.com will have some information in their online magazine’s regular reunion columns. See our Activities page for games too. It’s not specifically about genealogy, but try Adrienne Anderson’s book Fun and Games for Families. What are everyones’ interests and considerations? Are they athletic? Have tournaments of golf, softball, volleyball with medals for the winners, of course. Are they sedentary? How about board games: use your favorites. Are they into the Fourth of July games that are silly and keep everyone laughing? Sack race, three legged races, water-filled balloon toss. Are they into family history? Make up family history trivia. Questions that everyone can answer, questions that can probably only be answered by some, questions for specific and all ages, questions that will illuminate, educate and intrigue. How about a treasure or scavenger hunt? You didn’t mention genealogy games specifically, but there are some family history games in regular stores; Generations, LifeStories, Reminiscing. You probably can only get Questions and Ancestors from Conestoga Book Service, Box 7, West Willow PA 17583. Visit our games or make up some of your own – word games, crossword puzzles. Also check Adrienne Anderson’s Fun and Games for Families; probably in your library. Dear Abby dispenses advice to a reader whose husband refuses to attend a family reunion because he doesn’t approve of his mother-in-law’s choice of a decades younger boyfriend. The reader hasn’t seen brothers, sister, nieces and nephews for six years and wants to go. Abby advises that the reader tell her husband he’ll be missed, but she will attend anyway because as adults we should not judge, lest we also be judged. I was recently in Flint, Michigan, for a meeting with reunion organizers presented by the Flint Area Convention and Visitors Bureau (CVB). What a delight! The concerns of reunion organizers, I find, are universal. These are reunion topics I hope to develop some dialogue about … and encourage your input if these are issues you deal with. Everyone battles the financial monster: how to pay for the reunion, how to raise money to help pay, how to be affordable for members on fixed incomes. In Flint many families reported having auctions, raffles and white elephant sales for which all members donate items. Many were concerned about raising money to pay for reunion space, food, activities and scholarships. Others order t-shirts and souvenirs or develop a cookbook or make a quilt to sell. Everyone was very interested in corporate gifts which require careful planning and a well conceived and written letter. What always impresses me at these occasions is how dedicated reunion organizers are. How eager to learn about new ideas. One audience member mentioned a fairly simple game that was described in one of our earlier issues. She was asked over and over to explain by people who were writing copious notes for themselves. Reunion organizers are wonderfully generous with their ideas, suggestions and willingness to share. If you’re thinking about a reunion in or near Flint, Michigan, I encourage you to contact the Flint Area Convention and Visitors Bureau, 519 S. Saginaw St, Flint MI 48502-1802; 810-232-8900. They have an impressive list of services to assist you. Looking for Awards and Prizes?